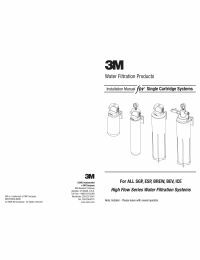 3M™ Water Filtration Products Model HF25-S-SR5 is a single cartridge that helps provide consistent high quality water for commercial ice by reducing the effect of sediment and biofilm at flow rates up to 2 gpm. Built-in scale inhibition reduces the ability of calcium and magnesium to precipitate on the evaporator plates as hard scale. The HF25-S-SR5 uses a patented multi-zone, polypropylene pleated media which provides exceptionally high surface area. For low flow cubers to 750 lbs. For high flow cubers to 200 lbs. For flakers to 1,200 lbs. Save electricity and boost your ice production volume with the compatible ChillTech Heat Exchanger. 3M™ Water Filtration Products is formerly known as CUNO Incorporated. CUNO Incorporated was previously divided into CUNO Food Service, Aqua-Pure, and CUNO OCS.